San Francisco's Imagika have been in business since the mid- 90's when they began their mission of carrying on the good old Bay Area thrash sound. While never gaining the notoriety that they perhaps deserve, these guys have the distinction of having the finest vocals of any thrash band, or at least any pure thrash band that I've heard. Whether you're talking about original singer David Michael, or current frontman Norman Skinner, who has been with the band since 2001, Imagika have struck gold twice in the singing department. Combine those strong, powerful, clear vocals with sharp, fast guitar chops (similar style to Jeff Waters of Annihilator) and a ferocious rhythm section and you have a complete catalog of killer albums. While Imagika's last few offerings have been slightly less thrashy, maybe leaning a bit more towards contemporary American power metal, their basic style hasn't strayed too far from their formula and it would be a tough call to name any of their first five as their best. 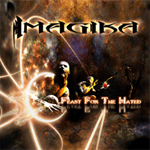 Naturally I expected Imagika's newest effort 'Feast For The Hated,' to be much of the same, but to my surprise, this one is a bit different. Right from the start most fans will notice that these songs are structured a bit different from their past works. "Feast For The Hated' is not a progressive metal album, but there are definitely some progressive elements to a lot of these tunes. Abrupt stops, acoustic interludes, and breakneck starts are all twists that Imagika add this time around to create this rollercoaster of a disc. Another big difference is that the band gets back to basics, making this a decidedly thrashier album, at least from the more recent Imagika releases. While both experimental and a return to the bands' roots, 'Feast For The Hated' takes a little longer to digest, but it is at least as good, if not better, than any of its predecessors once you get used to it. While both experimental and a return to the bands' roots, 'Feast For The Hated' takes a little longer to digest, but it is at least as good, if not better, than any of its predecessors once you get used to it.